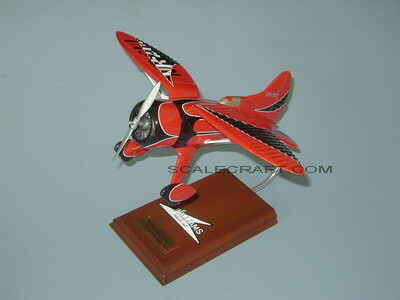 Mahogany Airplane Models > Historical, Racing and Unusual > Hall "Bulldog"
The Bulldog Racer was designed and built by Robert Hall. An engineering/test pilot in the early 1930s who had worked for the Granville Brothers and helped them design the famous Gee Bee-Z, after a disagreement with the Granville's, Hall left the group and went on to design his own airplanes. First was a two place airplane to fly in the England to Melbourne Race, the airplane was named Chicada and was painted to look like an insect. His second airplane design,financed by the Guggenheim family was a small single place, gull winged airplane to fly in the 1932 Cleveland National Air Races and the Thompson Race. The gull wing feature of the "Bulldog" caused a problem in directional control stability, and several modifications of the vertical fin and rudder were made,the fin and rudder area above the wing level was increased to escape turbulence from the gull wing, reversal of lateral control was experienced with the ailerons, before downward deflection was eliminated. In qualifying for the Thompson Race the Bulldog reached a speed of 243.717mph.In the race the speed was a disappointing 215.57mph with a very brief top speed of 270mph. In the Thompson Trophy event competing against the Gee Bee R1&R2 and three Wedell Williams Racers, the "Bulldog" finished in sixth place. It is speculated that a restricted air inlet kept the "Bulldog from showing its true potential. The "Bulldog" was dismantled after the races were over and the engine was returned to Pratt&Whitney. Mahogany Wood. Scale: 1/20. Wingspan 15 3/4 inches, Length 11 9/16 inches.